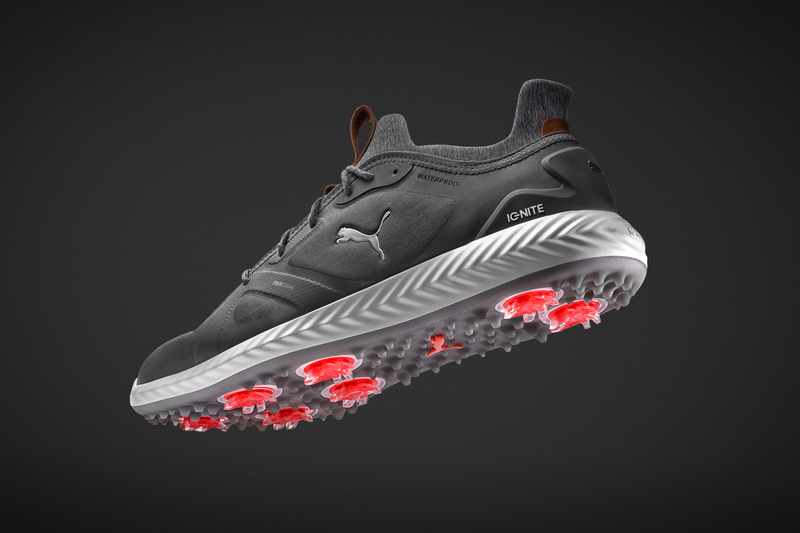 PUMA Golf once again rises the bar where footwear innovation is concerned in 2018. PUMA Golf has once again risen the bar where footwear innovation is concerned in 2018 with its brand new IGNITE PWRADAPT golf shoes. 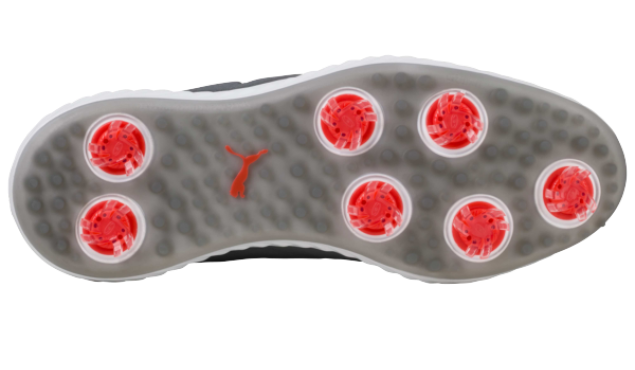 Worn by Cobra Puma staffer Rickie Fowler, the "game-changing" PWRADAPT technology is an all-new traction system that makes use of seven 3-dimensional traction pods, each designed to move with you and respond to pressure during the swing. These cleats really are something else! The cleats provide vastly improved ground-grabbing traction regardless of the lie you find yourself with, all thanks to the independent nature of them. 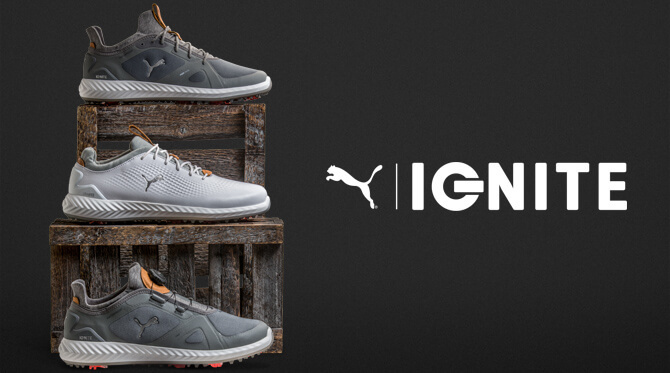 This is something never before seen in the golf footwear market. Having tested the IGNITE PWRADAPT golf shoe on both hard and soft playing surfaces out at Streamsong Resort in Orlando and back home at Hadley Wood Golf Club, we can assure you while this product provides you the cleated benefits of both traction and stability, it also exudes the feel, comfort and lightness of a spikeless offering. It really is a remarkably soft shoe, but one with bags of performance. 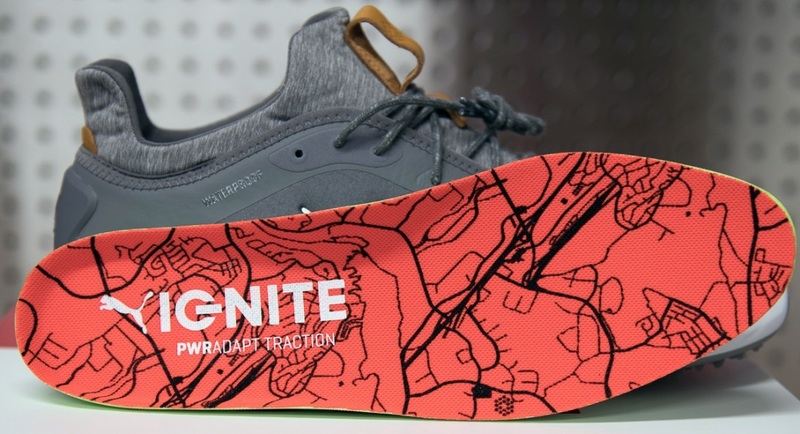 Just as we've seen with PUMA's recent golf shoe models, the ever so snug IGNITE foam is back for some more and provides the perfect marriage for the new PWRADAPT technology. The IGNITE foam may have been around a few seasons now, but we don't see it going anywhere for years to come. It's that darn comfortable! For 2018, however, the ultra-responsive IGNITE foam cushioning runs along the entire length of the midsole for the very first time, further enhancing the comfort factor for which PUMA has become renowned for. The shoe is also perfect for the British weather right now with a fully waterproof mesh upper with a two-way stretch for the ultimate lightweight comfort. Unlike previous mesh versions from the brand, this top-of-the-range shoe also features PWRFRAME technology; an ultra-thin TPU frame which reinforces the high stress areas of the foot when you swing. Stability is greatly improved as a result, all without impacting upon the lightweight and breathable comfort on offer. 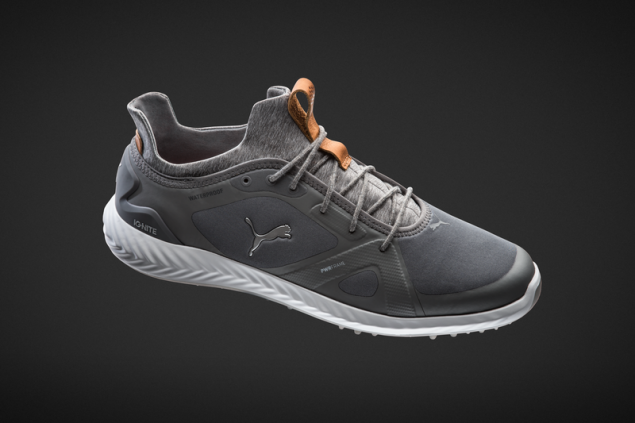 The other beauty about PUMA's new golf shoe offering is that it is available in three versions of IGNITE PWRADAPT, IGNITE PWRADAPT Leather and IGNITE PWRADAPT DISC, all of which are available at RRP £140. Check them all out here in our first look piece. I know for a fact if I was to recommend any of these three versions, I would hands down point you in the direction of the DISC - available at no upgrade cost unlike BOA - simply because DISC allows you to fit the shoe much better to your foot than is the case with laces, all at the twist of the clever DISC tool at the front of the shoe. A nice little sock liner also aids with getting the shoe on and off your foot - a simple touch to ensure you aren't wrestling with your foot before and after the round. All in all, we cannot speak highly enough of PUMA's new IGNITE PWRADAPT and we would thoroughly recommend anyone who is seeking the key benefits of a cleated golf shoe, but typically prefers the feel and comfort of a spikeless model, to give this product serious consideration in 2018. Take your pick from three different versions to suit your preferred playing style and overall fit, but we would certainly recommend opting for DISC. The fit is as good as anything you will see in today's golf shoe market. These shoes are now out in stores, so what are you waiting for! If you choose to get involved, we'd love to know what you make of them.